For that extra special break, each of our yurts, hobbit houses and tree house has a private eco wood-burner hot tub so you can soak under the star-kissed Pembrokeshire skies…..we even supply the wood so every little detail is taken care of. Dogs are welcome in our yurts and on our premium camping pitches so the whole family can enjoy the glamping holiday (but not in our hobbit houses or tree house, sorry). 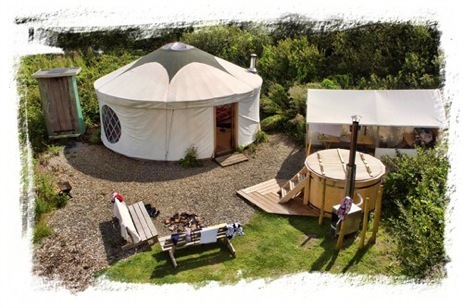 Our 5 traditional Mongolian yurts are 20ft in diameter and offer a little touch of luxury to your glamping holiday. 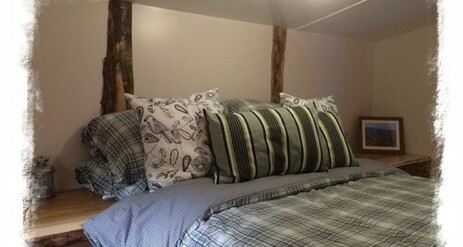 Each yurt accommodates 4 to 6 people in one double bed and two single futons. 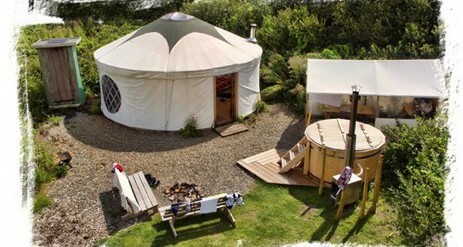 However, if your party consists of 5 or 6 people you are welcome to bring your own bedding or pitch a small tent on the grass area next to your yurt. Our yurts have full-height walls and doors and they are heated by wood burning stoves which adds to their warmth and cosiness. 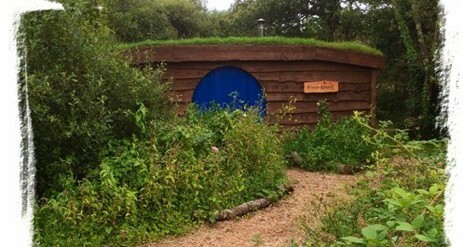 Why not try a totally new experience and stay in one of our unique wooden hobbit houses? Quirky, rustic and charming, our hobbit houses are wood clad with round windows, round doors and grass roofs, helping them blend into the surrounding environment. The houses are very cosy with fully insulated roofs and walls along with internal log burners. 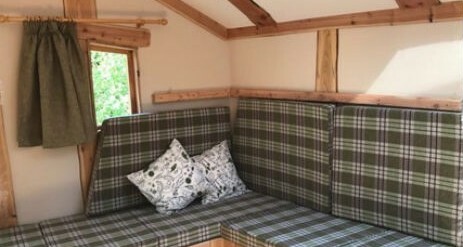 Our hobbit houses are 12ft x 22ft (240ft square floor area) and each sleeps a maximum of 6 people, with a double bed in the private room, cabinet bunk beds & 2 single sofa beds in living area. The 2 single beds can be joined to make a double. They are split into two rooms, both having wooden flooring. The main living space has a sitting area, log burner, breakfast table, L-shape sofa/single beds, cabinet bunks and double doors onto the rear decking and garden. The second room is a private double bedroom with doors and luggage storage. Our one-off, skilfully-crafted tree house sits high up in the trees offering unique, quirky and fun accommodation. 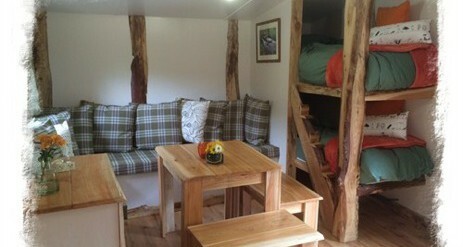 The tree house sleeps four people (2 adults, 2 children) with one double bedroom and a communal sleeping area. You’ll also find table and chairs and a log burner in the living area. The gorgeous balcony is set 8 feet off the ground giving you lovely private rural views over your own garden. 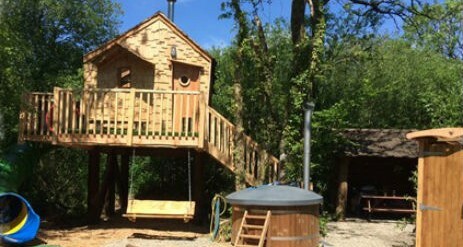 There are two ways down from the tree house – via the stairs or down the slide….great fun for all ages! Each yurt, hobbit house and our tree house has its own outside compost toilet, along with access to the brand new eco shower block with mains electricity. Every evening we replenish the ice blocks in your cool box and there is an eco charging station made from reclaimed wood where lanterns and phones can be charged. There is also a bin/recycle area and an outside tap for fresh water. PREMIUM CAMPING PITCHES ARE ALSO AVAILABLE with private garden, small BBQ, campfire, bench, undercover eating area, cool box, firewood, compost toilet (shared with another pitch), access to communal eco shower block and solar service & charging station. You’ll find two beautiful private fishing lakes on site; one offering trout and the other coarse fishing. Feel free to use the rods we supply (or your own equipment) to catch your own supper, which can be cooked on either your own BBQ or fire pit and eaten under the stars in the tranquil setting of Florence Springs. The lakes overlook an attractive 18-hole golf course which is available for booking daily. Florence Springs is set in a tranquil, rural location, yet it’s a perfect spot to explore the diverse attractions and natural beauty Pembrokeshire has to offer. Our glamping village is a stone’s throw from Heatherton World of Activities, Manor House Wildlife Park and Tenby Dinosaur Park. You’ll also find the seaside town of Tenby, Saundersfoot village, Folly Farm Adventure Park & Zoo, Oakwood Theme Park, Blue Lagoon, Carew Castle, Pembroke Castle, the Pembrokeshire Coast Path and an array of beautiful sandy beaches within a short drive.